Konoe koshaku onzoki dai ikkai nyusatsu (Auction of Duke Konoe Collection part 1) (Tokyo: Tokyo Bijutsu Club, 1918), pl. 108. Ausstellung Altjapanischer Kunst (Exhibition of old Japanese art) (Berlin: Verlag für Kunstwissenschaft Berlin, 1939), pl. 117. Maruyama Okyo hitsu gunkaku zu (Painting of a flock of cranes by Maruyama Okyo), Kokka 591 (February, 1940): pls. 6 and 7. Takeda Tsuneo, Takio Kimiko and Nan'ya Takashi, eds., Byobue taikan (Collection of screen paintings), bekkan (separate volume) of Nihon byobue shusei (Collection of Japanese screens) (Tokyo: Kodansha, 1981), p. 41. Sasaki Johei and Sasakin Masako, Maruyama Okyo kenkyu: Zuroku-hen (Study of Maruyama Okyo: Plate volume) (Tokyo: Chuokoron bijutsu shuppan, 1996), pl. 564. Sasaki Johei and Sasaki Masako, eds., Koga soran: Maruyama Shijo ha kei I/Kogasoran Photographic Archive of Japanese Paintings: Maruyama Shijo School I (Tokyo: Tosho kankokai, 2000), pl. 1471.1-2. Shizuoka Prefectural Museum of Art, ed., Jakuchu to Kyo no gakatachi/Jakuchu and the Artists in Kyoto (Shizuoka: Shizuoka Prefectural Museum of Art, 2005), pl. 22. The long-necked crane is said to live a thousand years, sharing the world of immortals in Daoist lore. Because cranes are monogamous, they are a symbol of happy marriage and one the most enduringly popular motifs in Japanese art. 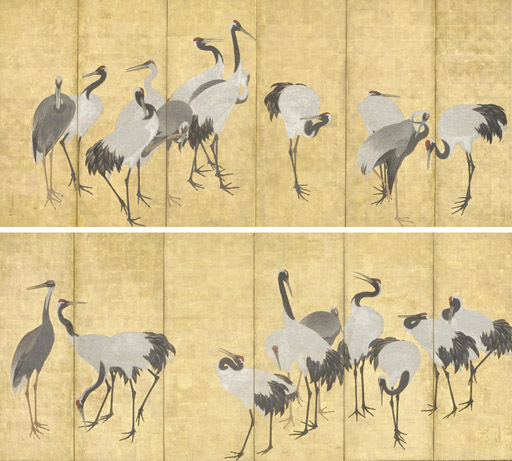 Here, a flock of twenty-three cranes makes an elegant composition against a stark gold ground. The artist shows two species of cranes, the familiar Manchurian crane (Grus japonensis) with a red crest and snow-white plumage and the white-necked crane (Grus vipio) with silver gray plumage and a red circle around the eye. The flock gains density toward the outer panels of both screens. Okyo's teacher, Ishida Yutei (1772-1786), tackled the subject in at least three pairs of screens, two of them in private collections in New York. Another screen with a flock of cranes by Okyo is in a private collection in Japan (see Osaka Municipal Museum of Art, Mainichi Shinbunsha and NHK, eds., Tokubetsuten Maruyama Okyo: Shaseiga sozo eno chosen/Special Exhibition Maruyama Okyo: Shaseiga--Challenging a New Frontier [Tokyo: Mainichi Shinbunsha and NHK, 2003], pl. 4). Okyo treats the subject with a new naturalism characteristic of the late eighteenth century. This pair of screens traveled to Berlin in 1939 for the famous exhibition of Japanese treasures that symbolized goodwill between axis powers on the eve of World War II. The exhibition included many registered National Treasures and Important Cultural Properties and drew the attention of all of Germany's leaders. Mitsui Takaharu, who had likely purchased these screens at auction in Tokyo in 1918, loaned many important works to the exhibition.